Mongolia shares borders with Russia and China in north-central Asia. Its northern border with Russia extends 2,202 miles (3,543 km) from the Altai Mountains in the west to the vast steppe in the east. Mongolia’s dry southern border with China stretches 2,906 miles (4,677 km). Mongolia has designated ten Sacred Mountains by Presidential Decree, each of which has Special Protected Territory status. 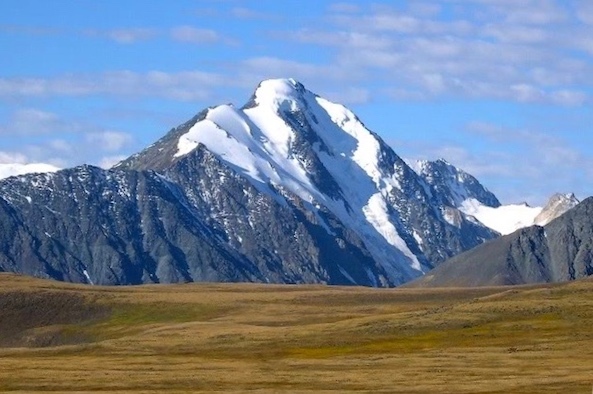 These ten mountains are: Bogd Khairkhan Mountain (Богд Хайрхан уул), Burkhan Khaldun Mountain (Бурхан Xалдун уул), Otgontenger Mountain (Отгонтэнгэр), Altan Khukhii (Алтан Хөхий уул), Darigangyn Altan Ovoo (Дарьгангын Алтан Овоо), Khan Khukhii (Хан Хөхий), Sutai Khairkhan (Сутай Хайрхан уул), Suvrag Khairkhan Mountain (Суврага Хайрхан уул), Altai Tavan Bogd (Алтай Таван Богд) and Gobi Gurvan Saikhan (Говь Гурван Сайхан). 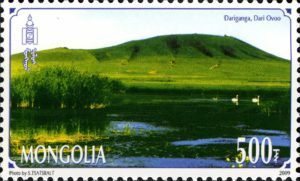 In 2010, Mongolia issued two sets of stamps commemorating eight of these State Worshipped Mountains and depicting the beauty, cultural and spiritual significance of these national treasures. Mongolia has a long tradition of venerating and protecting natural spaces. 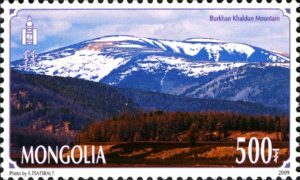 During the 12th century, Chinggis (Ghengis) Khan designated Burkhan Khaldun Mountain, part of the Khentii Mountain range, a Sacred Mountain of the Mongol people. In 1294, official texts documented Bogd Khairkhan Mountain as a natural reserve. In 1709, the “Khalkh Juram,” or Khalkha Rules, outlined social relationships in outer Mongolia and honored Buddhist temples and monks, stating that beautiful and scenic mountains and lakes were to be protected by State law. 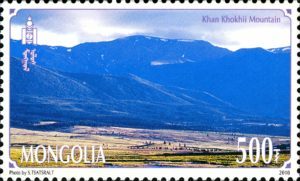 In 1778, through the efforts of King Yunndendorzh, Bogd Khairkhan Mountain, the Khan Khentii Mountains, of which Burkhan Khaldun Mountain is a part, and Otgontenger Mountain were declared State protected and worshipped sacred mountains. In 1911, Bogdo Khan enacted a law to worship Otgontenger Mountain every year. In 1992, the Mongolian Parliament adopted a goal of placing 30 percent of national lands under protected status. In 1993, the government formed the Protected Areas Bureau, and in 1994 Parliament passed the “Law on Special Protected Areas” to “regulate the use and procurement of land for state special protection and the preservation and conservation of its original conditions in order to preserve the specific features of natural zones, unique formations, rare and endangered plants and animals, and historic and cultural monuments and scenic areas, and to study and understand their evolution.” This law recognizes four categories of Special Protected Areas: Strictly Protected Areas (Дархан цаазат газар), National Parks (Байгалийн цогцолбор газар), Nature Reserves (Байгалийн нөөц газар) and National Monuments (дурсгалт газар). The “Law on Special Protected Areas” encompasses many more lands than the Presidential Decrees, offering much broader environmental protection. There are 20 territories designated as Strictly Protected Areas, plus 32 National Parks, 33 Nature Reserves and 14 National Monuments. On May 16, 1995, President Punsalmaagiin Ochirbat issued a Presidential Decree “supporting initiatives to revive the tradition of worshipping Bogd Khairkhan, Khan Khentii and Otgontenger mountains.” During this ceremony, President Ochirbat rededicated the Mongolian nation to the veneration and protection of these three sacred mountains with nationwide state ceremonies to occur at each mountain every four years. Presidential Decrees followed in 2004, 2005, 2007 and 2012 for Dariganga Dari Ovoo, Altan Khukhii, Suvrag Khairkhan Mountain, Sutai Khairkhan, Khan Khukhii, Altai Tavan Bogd and Gobi Gurvan Saikhan. Individuals, households and communities throughout Mongolia are connected to the landscape through legends and rituals performed to communicate with local deities for good harvest, healthy livestock, personal health, safe travels and the prevention of natural disasters and drought. Practitioners perform rituals employing both shamanic and Buddhist methods and veneration comes in many forms, from personal practice to national celebration. Ovoos (stone cairns) are built at sacred spaces as power points of influence and as offerings to earth and sky. Dr. Sukhbaatar found that over 280 venerated mountains have their own holy Buddhist texts, called sutras. The recitation of these sutras honors local deities through poetry and symbolism. There are strict rules governing male and female veneration. Women are prohibited from climbing any mountain and their participation is limited on some sacred mountains to special places in the foothills. Men may climb sacred mountains and perform ceremonies at the summit. For example, at Darigangyn Altan Ovoo, women are prohibited from climbing the cairn and may only climb a smaller site nearby or walk clockwise around the sacred mountain. Men who reach the summit of Darigangyn Altan Ovoo burn juniper and pour libations as offerings. Buddhism has been part of religious experience on the Mongolian steppe for more than a thousand years. However, Buddhism was not formally adopted into Mongolia’s political life until the 13th century with the Yuan Dynasty emperors conversion to Tibetan Buddhism. Buddhism’s influence waned with the collapse of the Yuan Dynasty but saw a resurgence in the 16th century to become central to Mongolian spirituality and social fabric. Monasteries and temple complexes were part of every region of Mongolia and were connected to ruling elites through wealth and power in their local communities. Likewise, thousands of men and boys became monks connecting families with Buddhist traditions and practice. As with shamanism, Buddhism was suppressed by the socialist government of the 20th century. Monasteries were destroyed. Buddhist texts disappeared. Many lamas (monks) were imprisoned or killed. Buddhism has found a role again in contemporary Mongolia, and today there are approximately 200 temples with practicing monks and nuns. Shamanism has thrived side-by-side with Buddhist tradition in Mongolia for more than a thousand years, but was also suppressed between 1924 and 1990 by the socialist government of the People’s Republic in favor of a secular society. After the revolution of 1990, Mongolia saw a thousandfold increase in the number of practicing shamans, from approximately 10 individuals in 1990 to more than 10,000 today. Shamanic practice is also incorporated into the lives of ordinary people and comes to the fore daily in rituals honoring sacred spaces throughout the country. Shamanic practice illuminates an ancient understanding that veneration of sacred sites is the agency of the individual within her or his home, local community and landscape, and through diverse cultural and religious traditions. Well-being for the practitioner, such as a traveler who builds an ovoo, as well as protection of sacred sites, are the tangible results of this spiritual action. Mongolia’s sacred mountains are named for their appearance, relationship with the sky and earth, associated deities, and rank afforded them by political leaders throughout Mongolia’s history. Place names draw on words and concepts from several sources, including Mongolian, Tibetan and Turkic languages. For example, Sutai (Сутай) refers to the snowy appearance of a mountain. Gurvan (гурван) means three and Tavan (Таван) means five, describing the shape of high ridges. Tengeri (Тэнгэр) stems from shamanic practice referring to sky or Heaven and the deities who reside there. Bogd (Богд) comes from the Buddhist tradition meaning saint, holy or sacred. Khan (хаан) is the Mongolian word for King, and Khairkhan (Хайрхан) has multiple meanings, including Sacred, Benevolent, or Loving King. Ranking aligns veneration of each mountain with the respect that is afforded a ruler or leader of the nation. Legends tell of deities that are associated with the landscape and specific mountains, and the geographic attributes and physical appearance of a site often indicate the kind of deity who resides there. “The main purpose of deifying mountains is to please the possessor and deity of the land and ask for blessings and benedictions for the well-being of the province, families and livestock.” (Sacred Sites of Mongolia, page 27) Through the centuries, stewardship of the environment has been important to the survival of nomadic and semi-nomadic Mongols, and in modern times the society as a whole has continued religious traditions and practices that promote and reinforce ecological conservation, which in turn helps maintain traditional Mongol lifestyles and the environment. Stone cairns known as ovoos are built at sacred sites as altars or shrines. According to spiritual practice, an ovoo serves as a power point of influence within the landscape and is home to an ancestral spirit. Each ancestral spirit communicates with the deities of Heaven and Earth. Ovoos were originally part of shamanic tradition and were later adopted into Mongolian Buddhist practice. Built on the top of a mountain or other high sacred spaces such as mountain passes, humans pay homage to the deities who inhabit the land through personal rituals. Travelers may add rocks to an ovoo, circumambulate the ovoo three times in a clockwise direction for a good journey, or leave offerings of food and drink. In a ceremony for the worship of Heaven that takes place at the end of summer, practitioners place a tree branch or stick in the ovoo and tie a blue khadag, a ceremonial silk scarf symbolizing the sky spirit Tengeri (Тэнгэр), supreme god of Heaven. The ritual involves lighting a fire and making offerings of food, followed by prayers, dance and a feast. Sutras are holy Buddhist texts containing truths or principles, which in the context of Mongolia’s sacred mountains, are a record of wisdom from Mongol culture. Written in Tibetan, the religious language of Mongolia, sutras describe nature and deities through poetry and symbolism. Similar to the practice of making offerings at ovoos, Buddhist sutras have long been spoken in prayer to pay homage to local deities and ask for blessings. Mongolian shamanism and Buddhist practice are made tangible through the presidential decrees and national ceremonies honoring sacred mountains, which unite the each person’s actions and agency with national cultural pride and natural conservation efforts. The shamanic practice of lived experience creating authenticity and tangible results is borne through the presidential decrees, as veneration produces protection, and practiced spirituality results in the conservation of Mongolia’s natural spaces. Since 1995, Mongolia has honored its sacred mountains through nationwide state ceremonies every year. At these ceremonies, the president, along with Buddhist lamas and local shaman, venerate the sacred mountain through speeches, rituals, sutras and prayer. Mongolia’s longstanding political protection of sacred mountains makes the safeguarding of sacred natural sites an integral part of national governance and relevant in efforts to limit unregulated tourist and commercial interests, such as hunting, mining and other polluting activities. Article 12 of the “Law on Special Protected Areas” (1994) prohibits the following activities in protected areas: changing natural features (mining, digging, explosives, logging), harvesting natural resources, hunting and trapping or disturbing fauna, constructing buildings, using substances that produce negative environmental impacts, and conducting activities that pollute the soil, air or water. Environmental protection has continued into the 21st century with laws such as the “Law on the Prohibition of Mining Operations at Headwaters of Rivers, Protected Zones of Water Reservoirs and Forested Areas” which Mongolia’s Parliament passed in 2009, limiting mining operations within areas critical for water and biodiversity protection. While other countries search for ways to incorporate environmentalism into their national conversation and impress upon their citizens the need for ecological awareness and conservation, Mongolia’s approach to conservation as both a spiritual and practical matter is compelling. The long tradition and centrality of the interconnectedness of Mongolia’s natural, spiritual, cultural and political dimensions has made protection of the natural landscape and sacred spaces synonymous with Mongol cultural identity, nomadic livelihoods and the nation state. Issuing state decrees to protect and honor sacred places is a concrete example of how legislation and public policy can effectively recognize and safeguard cultural treasures that also have great ecological significance. When such laws exist, nationwide ceremonies that venerate sacred places unite citizens within a common history and identity and instill pride in individuals for the nation’s environment. Decree #110 by President Punsalmaagiin Ochirbat on May 16, 1995. Nationwide State Ceremonies: 1996, 2000, 2004, 2008, 2012. Bogd Khairkhan Mountain is Mongolia’s—and perhaps the world’s—oldest officially and continuously protected site. Officially declared a sacred mountain reserve in 1778, evidence of its protected status dates back to the 13th century. In 1778 the Mongolian minister of Khuree (Urga, present day Ulaanbaatar) Sanzaidorj sent a letter to the Qianlong Emperor requesting approval of annual ceremonies dedicated to Bogd Khairkhan Mountain. The Mongolian letter and the reply from Beijing in Mongolian is kept in the Central State Archives of Mongolia. The deity associated with Bogd Khairkhan is Dunjingarav, who rides 33 grey horses (a symbol of shamanism) and has the Buddhist mantra “um ma hum.” The sutra created by Triumphant Abbot Damtsagdorj (1781–1855) is used in rituals at Bogd Khairkhan. Decree #110 by President Punsalmaagiin Ochirbat on May 16, 1995. Nationwide State Ceremonies: 1998, 2002, 2006, 2010, 2015. Burkhan Khaldun is in the Khentii Mountains of Khentii Province, northeastern Mongolia. The mountain has held strong religious significance since being designated by Chinggis Khan in the 12th century. The Khentii Province is believed to be the birthplace of Chinggis Khan in around 1162. Burkhan Khaldun Mountain is where he performed his ceremonies and communicated with Tengeri and his protector spirits. Burkhan Khaldun boasts complex, unique biodiversity with flora of the Central Asian steppe. It is home to 50 species of fauna and 253 species of birds. Decree #110 by President Punsalmaagiin Ochirbat on May 16, 1995. Nationwide State Ceremonies: 1995, 1999, 2003, 2007, 2011. 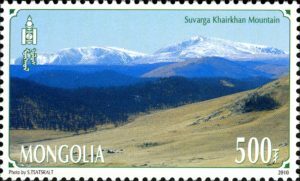 Otgontenger Mountain is the highest point of the Khangai mountain range, located in Buyant Bag of Otgon Soum, Zavkhan Province. The mountain the only peak in the Khangai range that is capped with a permanent glacier. Otgontenger was first decreed protected in 1779. Then, in 1911, Bogdo Khan enacted a law to worship the mountain every year. This practice was revived in 1992 after the collapse of the People’s Republic and in 1994 the mountain was designated a Strictly Protected Area. Since President Punsalmaagiin Ochirbat’s decree in 1995, Otgontenger has been ritually worshipped every four years. Earlier, people used to worship Otgontenger Mountain with shamanic rituals. Within the Buddhist tradition, the deity Ochirvaani, who is ferocious and male, is associated with Otgontenger. A sutra created by Lama Agvaanprinlaijamts (1860–1936) is read during worship ceremonies. Decree #44 by President Natsagiin Bagabandi on March 30, 2005. Nationwide State Ceremonies: 2005, 2009, 2013. 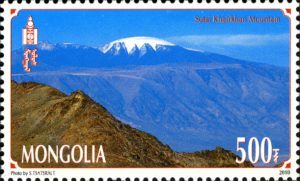 Altan Khukhii Mountain was designated a State Worshipped Mountain in 2010. The mountain is located in the Great Lakes basin of the Mongol Altai Range, 35 miles (50 km) north of Myangad Soum center and 95 miles (150 km) south of Ulaangom town. Decree #57 by President Natsagiin Bagabandi on April 23, 2004. Nationwide State Ceremonies: 2004, 2008, 2012. 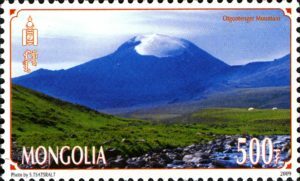 Darigangyn Altan Ovoo, also known as Dariganga Dari Ovoo (Golden Cairn), is a volcano in Dariganga Soum in Sukhbaatar Aimag. The Eighth Jebtsundamba Khutuktu Bogd Khan (1869–1924), the theocratic ruler of Mongolia, declared Darigangyn Altan Ovoo an officially worshipped mountain. Bogd Khan was the preeminent living Buddha of Mongolia, who ranked third in the Lamaist-Buddhist ecclesiastical hierarchy, after the Dalai Lama and the Panchen Lama. Decree #183 by President Nambaryn Enkhbayar on July 26, 2007. Nationwide State Ceremonies: 2008 and 2012. 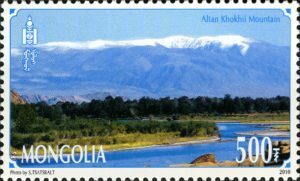 Khan Khukhii Mountain, along with Khan Khukhii Lake, Khyargas and Airag lakes, and the headwaters of the Zavkhan and Khungui rivers, has been protected as a national park since 2000. The area is also significant for the tumuli (ancient burial mounds) found there. Khan Khukhii has a female deity who is said to meet with the male deity of nearby Tagna Mountain every month. Sutai Khairkhan is the highest of the Gobi-Altai Mountains in the Central Asian plateau. It spans the boundaries of Tonkhil and Darvi soums of the Gobi-Altai Province and the Darvi and Tsetseg soums of Khovd Province in western Mongolia. This State Worshipped Sacred Mountain rises 13,845 feet (4,220 meters) and is covered in glaciers and snow. It is home to rare and endangered plants and animals. In the 17th century, the sutra “Sutai khany san” was created for worship of the Sutai Khairkhan. The sutra is still used during the rituals for the mountain. Decree #183 by President Nambaryn Enkhbayar on July 26, 2007. Nationwide State Ceremonies: 2011. 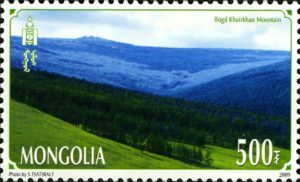 Suvrag Khairkhan forms the eastern part of the Khangai Mountains in the Tsenkher Soum of the Arkjangai province. This State Worshipped Sacred Mountain rises 10,430 feet (3,179 meters) and is noted for its thick forests, rocky surfaces and snow-capped peak. Decree #153 by President Tsakhiagiin Elbegdorzh on August 24, 2012. Nationwide State Ceremony: 2014. Altai Tavan Bogd is a National Park and is home to over 10,000 Neolithic and Bronze Age Tsagaan Salaa rock paintings. Decree #153 by President Tsakhiagiin Elbegdorzh on August 24, 2012. Nationwide State Ceremonies: 2013 and 2018. Gobi Gurvan Saikhan is a National Park. The land has been protected from development since 1963 and is home to more than 200 bird species, as well as endangered species, such as snow leopards, wild camel and ibex. Chimedsengee, Urantsatsral, and Amber Cripps, Victoria Finlay, Guido Verboom, Ven Munkhbaatar Batchuluun, Ven Da Lama Byambajav Khunkhur. Mongolian Buddhists Protecting Nature: A Handbook on Faiths, Environment and Development. The World Bank, Alliance of Religion and Conservation, in partnership with Gandan Tegchenling Monastery, the Mongolian Ministry of Nature, Environment and Tourism, and The Tributary Fund, 2009. Dudley, Nigel, Liza Higgins-Zogib and Stephanie Mansourian, “Beyond Belief: Linking faiths and protected areas to support biodiversity conservation.” The Arguments for Protection Series. A research report by WWF, Equilibrium and Alliance of Religions and Conservation (ARC), December 2005. Oyundari, E. “State worship ceremony for Bogdkhan Mountain held” The UB Post, October 8, 2015.